Soak the bengal gram for half an hour, pressure cook until the dals turns soft.. meanwhile grind the grated coconut as coarse paste also make a syrup with jaggery and 1 cup of water.. strain the jaggery water (sometimes the jaggery may contains some undesirable things like tiny stones, muds) boil the jaggery water and add the cooked channa dal, condensed milk..mash slightly the channa dal while cooking, finally add the coarse coconut paste and cook until they turns slightly thick..
Fry cashewnuts in the ghee and add the nuts to the kheer, also garnish the kheer with any nuts as u desire..serve hot r chilled! Eggs are rich in proteins and its a healthy also nutritious food, its plays a main role for many food preparations also used as home remedy for skin and hair care..Eggs are rich in vitamin A, B12 and D..its contains high level of sulphur, amino acids and proteins, but doesnt contains highly saturated fat..Food preparation with eggs are always quite easy to do also u have many options with eggs, they can be served very well from breakfast to dinner...Egg is also an important ingredients for protecting our eyesight coz its contains vitamin A & D..Due to sulphur content, its protects and helps the growth of our nails, eggs are known as to aid the developement of brain and improve the functions of nervous system...egg white and egg yolk are well known for facial skin and hair, a mask of beaten raw egg applied to the hair, give moisture to the hair and prevents dryness, breakage..its makes the hair smooth and shiny..a mask of egg yolk applied to the face makes the skin smooth and fresh appearance...Eggs are always handy for me.. simple omelette toegg biriyani i love anything with eggs, here is my version of egg kurma and egg masala which i make often when i was bored to cook as they are quick to prepare.. Grind everything from the list 'To Grind' as fine paste with enough water, heat oil in a pan and add the whole spices, fry them until they turns brown, add the chopped onions, chopped tomatoes, ginger garlic paste, salt and saute everything until the raw smells goes on, add the slit opened green chillies and add finally the grounded paste and saute for few seconds, add enough water and bring them to boil, keep in simmer..make a small cross on both edges of the egg and drop gently in the gravy, cook for few minutes..add the coriander leaves and put off the stove..
Heat enough oil and add the chopped onion pieces, chopped tomato pieces, crushed garlic cloves and fennel seed powder and saute everything until the onion turns transculent and the tomatoes turns mushy..add the red chilly powder and salt , springle few water and cook for few seconds, meanwhile cut the eggs as two pieces..drop the halved eggs to the cooking masala and toss gently until the water get disappears, add finally the chopped coriander leaves and put off the stove.. Serve as sidedish for any rice dishes! Wash and soak the rice with coconut milk and water for 15 minutes, take a microwave bowl, add the ghee, cashew pieces and jeera and microwave for 1 minutes, now add the chopped onion,ginger garlic paste, slit opened green chillies and cook again for 1 minutes, stir in between and cook again for two more minute...add now the soaked rice along with water&coconut milk and with enough salt, stir everything and microwave for 15 minutes..stir in between every 5 minutes, while the last 5 minutes make sure the rice is cooked r not, if not u can cook as ur need...mine took 20 minutes...add the coriander leaves and serve hot! Prefect with Paneer jalfrezi !! also sending to WYF-Quick Meal by EC of Simple Indian Food..
Place the pastry sheet in the tart mould, pick the sheet with a fork, keep aside...Slice the potatoes as thin rounds, arrange the potato pieces over the sheet one by one, now springle the chicken chunks..meanwhile preheat the oven to 350F..also add the black olives to the pastry sheet...Mix together the cream, dry thyme, pepper powder and salt, beat everything as creamy custard..pour the custard over the veggies and springle evenly the mozzarella pieces over the veggies..
Bake the quiche for 20-25minutes in middle rack or until the crust turns brown...keep aside and let them cool..Cut them as wedges and serve simply with any salads..
Take a wide microwave bowl...add the cashew powder, milk powder, water and sugar together and mix with a spatula, microwave for 2 minutes in high, stir in between..Keep aside and let it cool..
Now it will looks like soft chappathi dough, roll r shape them as u desire..Garnish the pistachio..
Heat the sesame oil and add the chopped onion pieces, minced garlic, grated ginger and carrots and saute for few minutes, add the vegetable stock water and keep in simmer..cook until the carrot pieces gets cooked well...drain a cup of cooked water and puree the cooked veggies with cooked rice,salt, soyasauce, coriander leaves,redchilly flakes and pepper powder as smooth or bit chunky paste..add finally the cooked water to the puree and turn it as soup as u desire(thinner r thicker).. Serve it hot r chilled! Pondicherry beach, nothing will replace pondicherry beach and one of the best place u will surely watch out everyday whenever u go around the city if u r born and brought up in pondicherry...The beaches are the best place to relax in Pondicherry.The 1500 metre long beach that borders the town on the eastern side and an ideal place for swimming and sun bathing. There are two historical monuments on the beach.. One is the 4m tall statue of Mahatma Gandhi and the other is the War Memorial, built by the French in commemoration of the soldiers who died in the First World War. The Light House which stands 29m high and is over than 150 years old. This yellow peas sundal brings me loads of marvellous memories, i still remember an old man who used to sell this thenga manga pattani sundal near to Pondicherry Mairie every evening, we just love his sundal and whenever we go to the beach my dad used to buy for us...This is my mom version of beach sundal, i do often for our evening snacks which i prepared after a long for today's snacks..
Soak the yellow peas overnite r atleast for 6 hours....pressure cook upto 1 whistle with enough salt, drain the cooked water and keep aside...heat the oil in a kadai, add the mustard seeds, urad dal, red chilli pieces, asafoetida powder and let them splutters, add immediately the chopped onion, grated ginger, crushed garlic cloves, curry leaves and stir until the onions turns transculent, add the cooked yellow peas, toss gently for a while and add finally the grated coconut, chopped raw mango pieces and chopped coriander leaves..cook everything in simmer for a while until everything get well mixed..put off the stove.. Serve hot r cool as evening snacks!..This sundal goes to Pallavi's Sunday Snacks-Chaat/Indian Street Food..
Kathirikkai Kosthu or Kothsu,this side dish is very famous in Chidambaram, Mayavaram and also in Tanjore district, its a special dish in certain communites around Tanjore district..Its a tangy n spicy side dish made with brinjal n tamarind paste. Very good side dish with dosais, Idlies..This is one of my grandma's signature dish..There are various way to prepare this delicious kosthu, which is one of the traditional tamilian side dish for their morning breakfast, this is how my grandma, my mom used to prepare..
Cook the brinjal pieces in pressure cooker r in a pan with 1/4 cup of water if its in pressure cooker, else add little more water if u r cooking them in pan, until they cook well..grind them without extracting the water in food processor coarsely..keep aside. Grind all the ingredients under the list 'To grind' into a coarse powder..
Heat oil in a pan, add the mustard seeds, channa dal n urad dal, let them splutters..saute the onions until it turns transculent..extract the tamarind juice from the tamarind and keep aside.. once the onions r transculent add the tamarind juice and turmeric powder,let them boil until the raw smell disappears,add the brinjal puree n roasted spices to the tamarind mix..keep the flame in simmer once u add brinjal puree, add salt, curry leaves and cilantro leaves, stir them occasionally...Kathirikkai kosthu shouldnt be neither like sambar n nor like chutney..dont cook a long they may turn easily as chutney, so that its will tastes sour.. 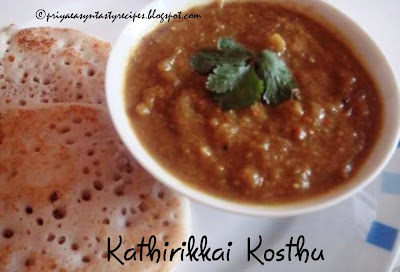 Delicious Brinjal Kothsu is ready! Since i have seen Almond fudge at Ramya's Passion for Cooking - Memory Archieved, my taste buds were longing to taste those chocolate treats, today i prepared this delicious fudge in microwave oven as the original recipe goes for stove top which needs few minutes to make this fudge, needless to say that microwave need just 5 minutes to prepare everything and this fudge turned out really very delicious and yummy, everyone at home couldnt able to wait until these delicios fudge get cooled in fridge, they want to taste this once i finished making..even i was relishing the spatula which i used to mix the fudge once i took the microwave bowl out from the microwave oven..It was sooooo yum! !, Thanks a lot Ramya for sharing this easy fudge, we loved it..
Take the condensed milk and butter in a large microwave bowl, cook in high for 1minute, mix both and add the chopped chocolate pieces, salt and vanilla essence, mix everything with a spatula and cook in high temperature for 2 minutes, take the bowl out from the oven mix everything and keep again for a minute, meanwhile line a baking sheet r aluminim foil in a plate r baking pan..mix the chopped nuts, pour the fudge over the pan or plate, springle the almond flakes over the fudge and keep in fridge, let it set for half an hour.. Serve cool or in room temperature! 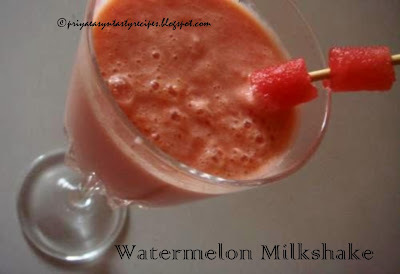 Add watermelon pieces, condensed milk, water n vanilla extract together in a food processor, beat well for a while...no need to drain the shake..serve them immediately with ice cubes....prepare them always fresh, dont keep them in fridge.. 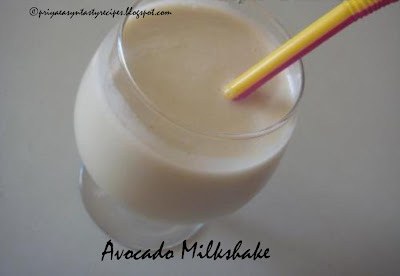 Choose ripe avocado for making this shake..cut the avocado into two.. with a large spoon, scoop out the avocado pulp and put them in a blender... add the chilled milk, sugar,vanilla extract n beat them well..serve with ice cubes.. Pound together the green onions, thai red chilli and garlic cloves into a coarse paste.. heat a pan and drizzle few drops of sesame oil, fry the tofu pieces until they get slightly brown , keep aside...Heat a tbsp of sesame oil in the same pan and add the coarse paste of onion-chilli, fry until for few minutes, add the vegetable stock, galangal piece, kaffir lime leaves, green curry paste, soya sauce, sugar and bring them to boil..keep in simmer..
Now add the pan fried tofu pieces, green and red bell pepper pieces to the simmering vegetable broth,cook for 5 minutes and finally add the coconut milk to the curry and cook for few minutes..garnish with sesame seeds. Serve hot with hot steaming jasmine rice! Delicious chickpeas and potato curry, u can check Lisa's Spicy Chickpeas and Potato Curry, an excellent curry ... Thanks a lot Lisa, we really enjoyed ur chickpeas curries for lunch and also for dinner along with my rotis! There are many kinds of noodles in Japan, udon are white and the thickest noodles, these noodles are made by kneading wheat flour , salt and water...Dried udon, boiled udon and fresh udon noodles are available at stores, to cook udon noodles we just need 2 minutes with hot boiling water..Udon can be eaten hot or cold and can be prepared in many ways as stir fry, soups also as cold salads...cold udon salads are really refreshing and popular in summer...This udon noodles salad with sesame seasoning is among the cold salads with udons, usually this udon noodles are garnished with grated ginger, nori(seaweed) etc but i prefer with sesame seeds and sesame dressing, which needs only 5 minutes and a very easy salad, prefect when served chilled...This is my second entry to AWED-Japanese guest hosted by Lavi of Home Cook's Recipes, event started by DK..
Cook the fresh udon noodles in boiling water for 2 minutes, drain the excess of water..meanwhile make the sesame dressing by adding the sesame oil, lemon juice, soya sauce, chopped coriander leaves, salt, pepper powder,grated ginger and sesame seeds in a large bowl..once the cooked udon noodles get cooled, add the sesame dressing and toss the noodles gently with wooden spatula until the noodles get well coated.. Serve chilled r in room temperature! 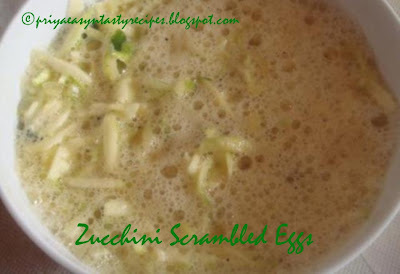 Prepare this dessert before an hour, if u want to serve it after a lunch or dinner... Drain the lychee, we dont want the syrup..Take a bowl add the lychee, coconut milk, sugar and salt..mix everything well until the sugar gets dissolved.. keep in fridge for an hour. 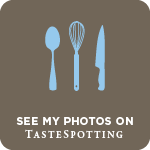 Delicious Chilled Lychee Coconut Soup!!!!!!! Puffs, when i tasted first time while i was schooling in India i didnt liked puffs much..i never choosed puffs whenever we go to bakeries, but once i came here i really started missing our bakery visits coz its was quite hard to find our Indian stuffs here..nowadays everything has been changed, Gare du nord/La chapelle in Paris have now loads of bakeries and sweet stalls (similar to Little India in Singapore)the fabulous place where u can find all Indian dishes, groceries etc , now we dont miss any indian dishes rite now..when i was a learning cooking i thought making puffs at home was a hard task for novices like me, i never ever thought that puffs are quite easier if u have puff pastry sheets, which turns ur puffs prefect as u buy in shops..Now i do prepare puffs within few minutes with puff pastry sheets and here comes puffs with eggs and mixed vegetable...Egg puffs goes to Event for Eggs by Sudeshna of Here I Cook..
Heat enough oil in a kadai and add the chopped onion, ginger garlic paste and fennel seed powder, saute everything for few minutes, until the raw smell disappears..cut the eggs as two pieces and add the egg pieces to the kadai with red chilly powder and garam masala powder and salt, toss gently and keep the flame in simmer, springle few drops of water and cook until the masala gets well coated to the egg pieces..keep aside and let them cool..Preheat the oven at 300F,Cut the puff pastry sheet as triangles, place the egg masala in the centre of the pastry sheet, just join the three ends of the pastry sheet..arrange the unbaked puffs on a baking sheet and bake for 20-25minutes..Just enjoy the egg puffs hot! Just follow as same as egg puffs, while adding egg pieces u need to add vegetables except the potato pieces and saute everything for a while and add finally the cooked cubes potatoes..cooking the vegetables and baking the vegetable puffs are same as egg masala!! 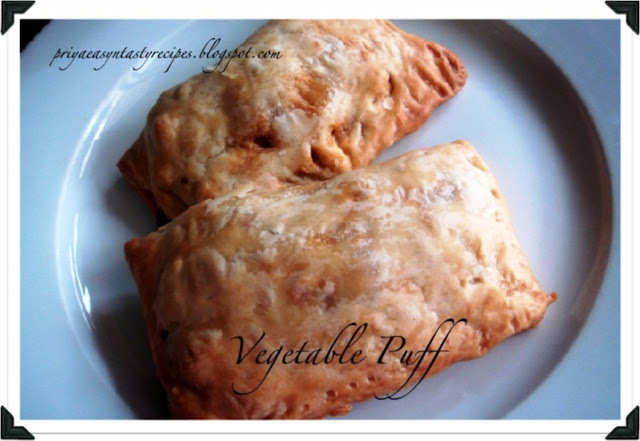 Enjoy egg r vegetable puffs with hot tea r coffee! Yennai Kathirikkai Kuzhambu , this delicious brinjal in oily gravy dish is one my grandma's signature dish...she used to prepare this gravy with fresh brinjals which she have already picked from her garden, usually she make this gravy out with green brinjals which turn this kuzhambu more delicious...But this gravy need almost 1/4th cup of gingelly oil to prepare and this gravy stay really good for a week, if u have some leftover of this gravy which never happen coz this tangy delicious gravy will surely disappear after a day, this gravy goes awesome with hot steaming rice and fried papads, nothing will beat this combo...this tangy gravy goes to Grammathu Kaimannam, event by Shama of Easy2Cook Recipes..
Add the redchilli powder, coriander powder, salt to the tamarind extract, keep aside... make a fine paste with tomatoes pieces, grated coconut and cumin seeds with enough water and keep aside...just cut the shallots r pearl onions as two pieces while the brinjals into quarter and soak in water..
Heat the gingelly oil in a kadai, add the mustard seeds, fenugreek seeds, garlic cloves,curry leaves and let them crack, add the brinjal pieces, saute till the brinjal gets half cooked, now add the tamarind extract, grounded paste and let it boil...Cover the kadai with lid and keep in simmer for few minutes, switch off the stove once u can see the oil on the top of the gravy.. 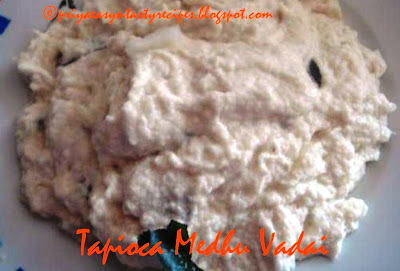 Serve hot with rice and papads! Varunavi,Pooja,Priya Sriram,Prathibha,Shama and Suparna shared a lovely award with me, thanks a lot my friends its really very encouraging also am excited.. I want to share this award to all my blogger friends, coz i love them all and their blogs..feel free to pick this award friends! 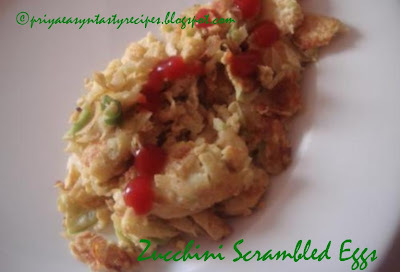 Beat the eggs with turmeric powder and salt, keep aside..add the grated zucchini, chopped gren chillies, pepper powder to the beaten eggs..Here i didnt fried the onion, as i grated the onion i added them directly with the beaten eggs, if u dont like u can fry ur onions with few drops of oil and add the fried onions to the beaten eggs, no need of frying the zucchini pieces coz they will get cooked very easily..
Zucchini scrambled eggs are ready to eat!!!! Tapioca roots are highly rich in carbohydrates also these roots are gluten free, and nearly protein free...making vadai out of this delicious tapioca roots is one of the best snacks which my grandma used to do whenever we go to our grandma's village..My grandma's village is very much near to Tindivanam, its a cute little village which is still in Villupuram district brings me loads of beautiful memories..This medhu vadai is one of my favourite snacks from my grandma, i want to post this delicious snacks which makes me nostalgic for Shama's event, where she is asking her blogger friends for Village dishes....one of the easiest way to insert tapiocas in our dishes..none will find out the difference between usual medhuvadai..Tasty medhuvadai goes to Grammathu Kaimanam a fabulous event by Shama of Easy2cook..
Soak urad dal atleast for 2 hours, meanwhile grated tapioca finely and keep aside,grind urad dal just sprinkle some water will helps to grind, while the urad dal is half grounded(never add more water even its hard to grind) add the grated maravallikizhangu to the urad dal..this will help to grind evenly both urad dal n maravallikizhangu, let them grind for a while..take off the vada batter in a large bowl..
Add finely chopped onions, green chillies pieces,curry leaves, chopped cilantro leaves, ginger, fennel seed powder, salt n mix everything together..heat oil in a pan, take a small ball out of the batter n make them as vadai, make a small hole in the middle of the vadai n pour it in hot oil, do them as batches.. 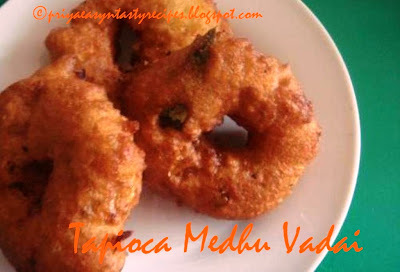 If the batter is slightly watery, can add a tablespoon of rice flour.. In a small bowl, put soy sauce, rice vinegar and sugar, stir them well until the sugar gets dissolved, set aside. Boil water in a pan,put the noodles in the boiling water and cook for about 8 minutes, until they are tender...drain water from the noodles and rinse them with cold water. Transfer the noodles to a serving platter and garnish the noodles with chopped green onions (optional) serve hot! Orange ginger lemonade, i can say that this is one of our family's fav, this lemonade is quite a easy drink which u can prepare almost daily while its too hot by making out with different flavours with mango, strawberry etc...This is a refreshing drink with loads of vitamins and slight gingery flavour...this lemonade goes to Refreshing Drinks by Anu sriram of Chandrabhaga also am sending to Priti's Summer Treat..
Bring boil the water with sugar and ginger pieces...keep aside n leave it for half an hour, strain the gingery sugar syrup.. add now the fresh orange juice, lemon juice to the sugar syrup..add enough water as per ur need to lemonade..
Stir everything well and serve with crushed ice and lemon slices! On the way to Srivalli's Mithai Mela.. Tomatoes are rich in not just one vitamin but three. Vitamins A, B and C can be found in tomatoes as well as beta-carotene, fiber and anti-oxidants. Tomatoes lower cholesterol levels which lowers the risk of chronic heart disease, and they also promote healthy skin.Another plus for the tomato is its versatility. Tomatoes can be enjoyed so many ways. Even if a person doesn’t like to eat tomatoes raw, they still like as tomato sauces and enjoy pizza, spaghetti or even tomato juice.Tomatoes are full of the nutrient, Lycopene,a vital anti-oxidant that helps guard against breast, prostate, pancreatic, intestinal and other cancer...Here is my chilled tomato soup which needs hardly few minutes to prepare with simple ingredients...this chilled tomato soup goes to No Croutons Required by Holler of Tinned Tomatoes..Holler has asked all the participants to come up with a birthday menu for their entry for April..its quite fun and i enjoyed preparing my birthday menu..Holler this is for u!! As Meal: Coriander n Soyachunks Pulao, Tofu Manchurian,Butter Naan, Hyderabadi Paneer 65..
Heat the olive oil in a pan , saute the tomato pieces and potato pieces for few minutes.. add the vegetable stock water and bring it to boil, keep in simmer.. cook until the veggies gets cooked ,keep aside...blend the cooked veggies with a hand blender..keep in fridge for an hour..
Preheat the oven at 350F...mix together the all purpose flour, corn flour, baking soda, baking powder in a large vessel...beat together the sugar, yoghurt, canola oil, orange juice with orange food colour until everything turns soft...add gradually the dry ingredients until the cake batter turns soft...fold gently the orange rinds and chocolate chips...grease a cake pan and pour the cake batter...arrange the cake mould in the middle rack and bake for 35-40minutes r until the skewer come out clean...cool it completely! Coriander leaves act as stimulants and tonics for the stomach, strengthening its functions as well as promoting digestion. Coriander juice, when mixed with a pinch of turmeric powder, serves as an effective remedy against pimples, blackheads and dry skin. Cilantro is good for treating nausea and intestinal gas and is also a good source of dietary fiber. Coriander are good to provide effective protection against urinary tract infections. Coriander keeps health problem at bay, by helping lower bad cholesterol and raise good cholesterol. Cilantro leaves are good source of iron and magnesium...Initially i want to prepare simple rice with coriander leaves but finally i prepared coriander pulao with soyachunks...i love soyachunks very much, i used to add soyachunks in gravies with veggies but rarely in rice dishes..
Cook soyachunks in hot water with enough salt until they double their volume, drain the water and squeeze out the excess of water, keep aside.. grind all the ingredients under the list 'To Grind' into fine paste and keep aside...Heat enough oil and add the bayleaves, cloves, cinnamon sticks, fry until they turn brown..add the chopped onion, chopped tomatoes with ginger and garlic paste, saute everything until the raw smell disappears,now add the cooked soyachunks, slit opened green chillies and saute for few minutes... add the grounded paste, salt n cook until the oil get separates..
Add the cooked rice immediately to the coriander paste and toss gently until the rice get well mixed...Serve hot with any spicy side dishes!! Soak the dals for 2 hours, drain the dals well and take the dals with green chillies an read chillies with salt, asafoetida powder in a mixer, grind them coarsely, add the ginger to the paste...dont grind them as smooth paste, in a steamer without whistle, steam the grounded mixture from about 10 minutes, once cooled , crumble it well with your hands..
Heat enough oil in a pan, add the mustard seeds, urad dal..let them crack, add the chopped onion and slit opened green chillies and curry leaves, saute until the onion turns transculant, add the chopped italian flat beans, saute for few minutes in simmer with enough salt until the beans get cooked (italian beans get easily cooked if they are cooked in simmer with lid closed), add the scrambled dal to the cooked italian beans and cook everything in medium high flame for 5 minutes, finally add the grated coconut and toss gently..
Red beets are high in carbohydrates and low in fat and it is an excellent source of folic acid. It is loaded with antioxidant that helps the body against heart disease, certain cancer especially colon cancer and even birth defects. Betacyanin is the pigment that gives beets their red color..this pigment is absorbed into the blood corpuscles and can increase the oxygen-carrying ability of the blood. Don't throw away the green leafy tops as they can be cooked like spinach and are also rich in beta-carotene, folic acid, chlorophyll, potassium, vitamin C, and iron.Kalonji seeds are about the same size as sesame seeds, they have a more triangular instead of oval shape.They can be added to traditional indian flatbread, any type of curry and to dal...I prepared this simple rice with kalonji seeds and beets..this delicious rice dish goes to Think Spice- Think Kalonji guest hosted by Dee of Ammalu's Kitchen, event started by Sunitha also to CFK-Rice guest hosted by Trupti of Recipe Center, event by Sharmi..
Heat enough oil in a pan, add the nigella seeds n let them crack, add the chopped onion pieces, slit opened green chillies, curry leaves with enough salt until the onions turns transculent, now add the beetroot pieces with coriander powder and garam masala powder, cook everything in simmer, springle some water and cook until the beets pieces get cooked..
Add the cooked basmati rice to the already cooked beets and toss gently until everything get well mixed, serve hot with papads!! On the way to Single Serving Recipes event by Sahaja of Spicy Rasam! Waa hoo!!!! 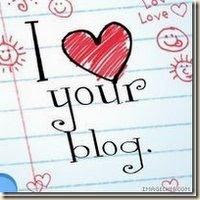 My 500th post !! 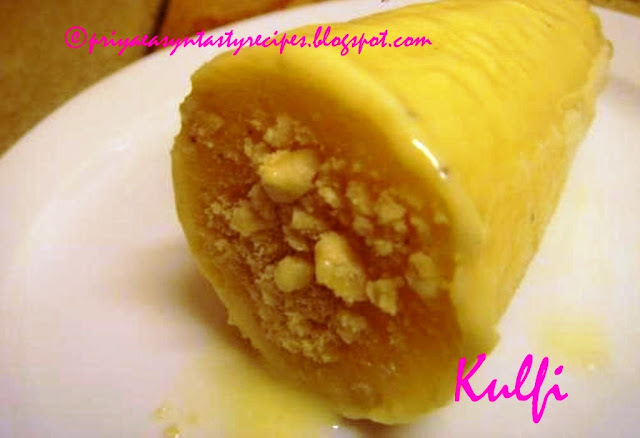 !, am gonna celebrate this 500th post with delicious kulfi....Kulfi is a popular flavoured frozen dessert of the India made from milk. In taste, texture and preparation, it shares commonalities with ice cream.Kulfi was traditionally prepared by evaporating sweetened and flavored milk by slow cooking, with almost continued stirring to keep milk from sticking to the bottom of the vessel and burning, till its volume was reduced to half, thus thickening it, increasing its fat, protein and lactose density. Additionally, it gets its peculiar taste due to caramelization of lactose and sugar due to long and slow cooking process. Nowadays kulfis are prepared with sweetened condensed milk with sugar and nuts, i prepared kulfis last week with whole milk , the prefect traditional way. Boil the milk with sugar in a pan with large surface, it will help to boil the milk faster ...stir it well continously with heavy flame...once its starts boiling keep simmer..Add cardamom powder in the milk n stir it well...meanwhile prepare finely chopped r smashed cashews (put cashews in a ziploc bag n smash it with heavy weight lid) dont grind in blender it will powder the cashews..
Keep scrapping off the milk-skin from the sides and bottom of the pan every few minutes and putting it back in the simmering milk...coz this skin gives a rough texture to the kulfi..add 3tbsp of water to the custard powder n dissolve it..add this to the simmering milk,can use corn flour instead of custard powder...this mix will give thickness to the milk...stir until the milk turn as condensed milk..now cool it..
Custard powder will give a yellowish colour to the simmered milk....can use corn flour very well to turn the milk thicky.. If there is no kulfi moulds...can use small cups else any coned shaped containers! On the way to Lets go Nuts-Cashew guest hosted by Poornima of Tasty Treats, event started by Aquadaze...Also goes to Srivalli's Mithai Mela..
After trying halwa with wheat flour and maida flour, i tried out halwa with corn flour...cornflour, is the starch of the corn grain..cornflour is also used as a thickening agent in soups and liquids. As the starch is heated by the liquid, the molecule chains unravel, allowing them to collide with other starch chains to form a mesh - thus slowing the movement of water molecules. 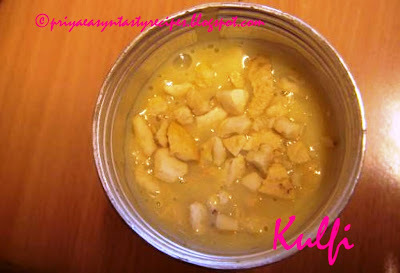 This results in thickening of the liquid, be it soup, stock or other culinary liquids. 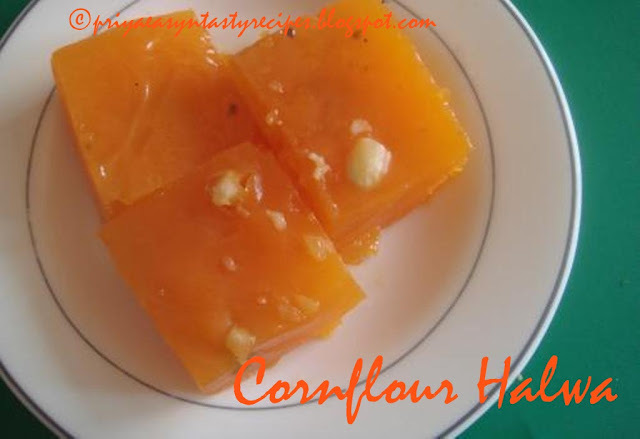 Cornflour halwa tastes delicious also very quick to make out, its ressembles quite like maida halwa..
Dry roast the cornflour in simmer for few seconds, take a heavy bottomed pan, mix together cornflour , sugar,salt n water everything nicely without any lumps . 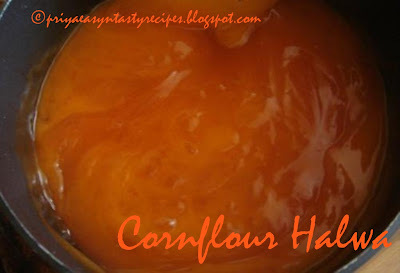 Heat the pan with the corn flour mix (it will ressembles like water)n stir it continously, after a while u may notice that they will start cooking and a transparent layer will appear while u take out ur spatula..at this stage keep the flame in simmer, add the pinches of food colour n stir them continously..
After a while they turns completely as jelly as shown in picture, be alert coz it will happens really very fast, add cardamom powder, ghee to the cornflour jelly..after few minutes they will turn as a dough n get off from the bottom of the vessel..add the cashew nuts r almond nuts, if u r using cashew nuts fry them with little ghee before adding, for almond nuts chop them n add directly to the halwa..put off the stove, grease a plate n pour the halwa to the plate, let them cool for atleast one hour. 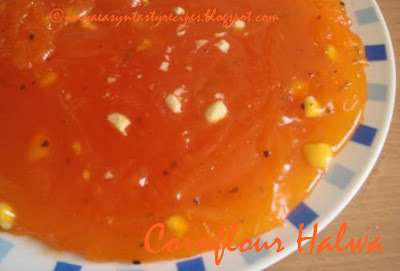 Blend the cantaloupe cubes, sugar syrup, lemon juice until smooth, strain the juice...pour the juice in a shallow container and freeze for 3 hours, scrape the mixture with a fork until its turns fluffy, freeze again, scrape again the granita before serving.. Refreshing salad with black olives...simple salad with cooked potatoes,few cucumber pieces, grated carrots, boiled corn kernels and black olives dressed with olive oil dressing...prefect for lunch also for dinner!!! potato is a versatile vegetable, rich in carbohydrate prepared in loads of variety way while carrot is rich in beta -carotene, which he body stores and converts to vitamin A, benefits of carrots is good for vision which proved scientifically....One cup of corn provides 18.4% of the daily recommendation of fiber. Its high fiber content is one of the biggest benefits of corn. Fiber has been shown to help lower cholesterol levels and help reduce the risk of colon cancer...Olives are concentrated in monounsaturated fats and a good source of vitamin E.Olives are also very light foods contain low calories, but at the same time very filling..This is my entry for Madhuri's Serve me some...Salads..
Whisk together everything for olive oil dressing with a fork and keep aside... take a large bowl, add the cooked potato cubes, grated carrots,cornkernels, black olives an cucumber pieces...add the olive oil dressing befor serving the salad..
Tasty Lemon Rice is Ready!! Heat the butter and fry the poha until they get roasted, keep aside...Bring boil milk, water, food colour and sugar, once they starts boiling put the flame in simmer and add gradually the roasted poha little by little and stir well , keep the flame in medium high also add the cardamom powder n cook until they get off from the bottom of the vessel, meanwhile heat the ghee in a pan , fry the cashew nuts until they turn slightly brown, add this hot ghee n cashew immediately to the poha kesari, stir well...put off the stove.. Since a long i wish to make pancakes with chocolate powder but as eggless version with buttermilk, today i tried out for our snacks, we enjoyed having this delicious, healthy coz i used dates syrup instead of sugar and whole wheat flour instead of all purpose flour, also i added one mashed banana puree to enhance the flavour of my chocolate pancakes, this is quite a easy snacks with healthy stuffs..personally i loved this chocolate version of pancakes coz they are really tasty when compared to usual pancakes, this pancakes doesnt even need any syrup, chocolate spread and anything else to have with them, the dates syrup i have added in this pancakes makes this pancakes prefectly sweet.. Mix together the whole wheat flour,salt, baking powder, chocolate powder, baking soda in a large bowl , keep aside..whisk together the buttermilk, banana puree n butter..add gradually the dry ingredients to the wet ingredients until they turns as thick batter..
Heat a pan, pour a ladle of pancake batter, drizzle few drops of oil n cook on both sides until they turns brown.. Healthy, Easy N Tasty Chocolate Pancakes!! Tofu is low in calories, contains beneficial amounts of iron especially important for women of child-bearing age and has no saturated fat or cholesterol. Tofu are quite rich in calcium too,tofu products can be split into two main categories: fresh tofu, which is produced directly from soy milk, and processed tofu, which is produced from fresh tofu...i prepared tofu manchurian sterday which was in my to do list since a long, this tofu manchurian is prepared with extra firm tofu marinated in soyasauce, green chilli sauce, cornflour for an hour,then deepfried n prepared again in sesame oil with green and red bell peppers...they tastes delicious, quite a easy dish which turns prefectly well as side dish. Tender french beans are always crunchy if they are cooked little bit, they suits prefectly for fried rice or simple rice with spice powders, here is a simple rice dish flavoured with our usual indian spices with red bellpepper n cooked basmati rice...Its a delicious rice tossed with few spice powders like pepper powder, cumin seed powder n garam masala, this masala rice suits very prefect if u r in hurry, tastes awesome even u prepare this rice dish as lunch box menu for kids, both french beans and red bell pepper turns this rice very flavourful n healthy...Crunchy french green beans and flavourful,colourful red bellpepper makes this dish more appetizing..u can also prepare this delicious masala rice with both green n red bell peppers too..but i prepared simply with french beans which i bought this weekend from farmer's market..
Heat the oil in a pan, add the whole spices n let them fry..add immediately the chopped onion with 1/4tsp of salt n stir until the onions turns trasnculent, add now the chopped french beans with pepper powder, garam masala powder, cumin seed powder and curry leaves also with enough salt..stir fry for few minutes or until the oil get separates, add now the chopped red bellpepper pieces n stir just for 2 minutes, redbellpepper pieces should be crunchy..Add the cooked rice to the veggies, toss gently until the rice get well mixed with spices n veggies..